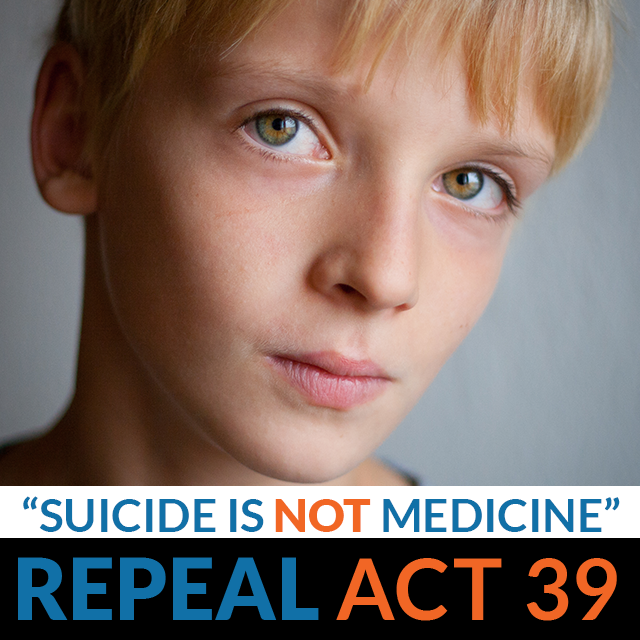 My client is the campaign to repeal the assisted suicide law (act 39) in Vermont, which was narrowly passed last year. It should be noted that the this mockup campaign is for class, and any implemented campaign will involve different photos. These stock photos are for illustration purposes only. 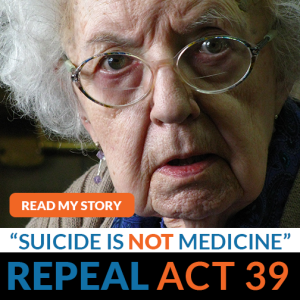 For several years, I’ve worked side by side with groups that previously had successfully fought off the Assisted Suicide law for over a decade (I joined the fight five years ago). I’m even a cofounder of a regional assisted suicide education and advocacy group True Dignity, and it’s origin group True Dignity Vermont. Since losing last year, I’ve moved and ended up worked with groups in other states. The opposition to Assisted Suicide is very broad, and goes across the political spectrum. 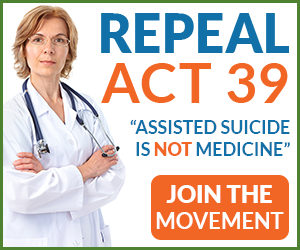 It include Disability Rights Activists groups like Not Dead Yet and Second Thoughts who view the laws as threatening to their life and dignity, the vast majority of doctors and pharmacists nationally and in targeted states (the proper medical name according to the AMA is Physician Assisted Suicide), activists against elder abuse, suicide prevention activists and more. 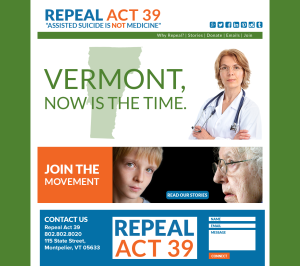 The target audience for this particular campaign are activists, voters and their legislators in Vermont. The audience is primarily liberal/progressive. The population of Vermont for 2013 was estimated at 626,630 persons of which only 19.6% were under 18. Only 43.7% voted or about 193,500. This group is probably the most likely to include those easiest to activate. 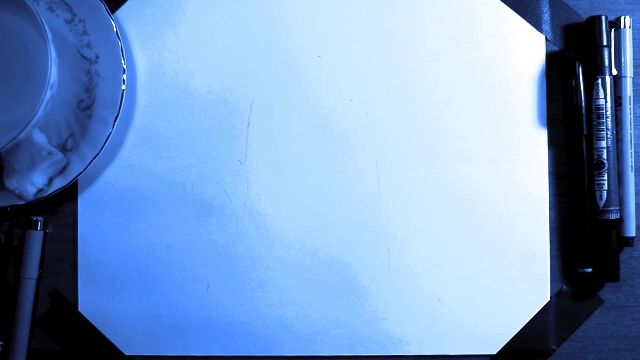 Integrated Marketing Campaigns has become the standard procedure for Political Campaigns, since the 2008 Obama Campaign was the first to really harness IMC and social media. Focus on individuals and relationships. Present focused message and vision. Leave no social media network unused. And the most fundamental part of a politcal IMC is the website. I believe principles of a successful political IMC must be consistency, courteousness, personableness and honesty. With these principles as the basis and guidance from the group, I think the campaign should be clear, personal, principled and courteous. Having personal stories is the best way to connect with the audience. And being clear allows everyone to know your message. I think that a website is necessary for any campaign, and should be central to the IMC. Since the demographic of Vermont is aging, I suggest including linkedin as an social media platform, in addition to the standards (Facebook, Twitter, and Google plus). I also suggest Pinterest, Instagram and Tumblr as these are some primary avenues of memes and viral images. 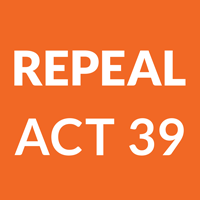 We can include graphics on our photo posts, so that when shared, the message is shared too, and subsequently the website (since it’s the same as the message “Repeal Act 39”). For the two additional graphics, I design a profile image for the campaign (for all social media sites) and a sticker for campaign events. As the campaign is beginning, it does not yet have a profile image, which is a critical piece of art work for a campaign. So I chose to design one and set it to fit twitter/facebook sizes. Which should also be transferable to other social media sites as well. Since this is a legislative campaign, stickers are an important part of identifying your audience at hearings and events, as well as being a way for your audience to feel like they are part of something larger. The sticker I designed at 5in x 5in 300 dpi since it’s for print. I also chose one color and paper-white to reduce printing costs. I suggest doing direct market research to find out who is most likely to be your audience so you can tailor messages directly to them I also suggest doing Google remarketing ads from allies’ websites, so you can maximize your initial audience for a low price. Additionally I recommend other targeted ads. Due to low budget I recommend research first to find out if the audience most receptive to the messages are easiest to reach via print, digital or a combination. I had started designing a different campaign focus, but upon review of strategy with client, I had to restart. Overall it was relatively straightforward, but required a lot of work hours. I sketched ideas, implemented them across all images, and then as I did that I developed new design languages that I brought back. So it was constant refinement as I went process, which given my timeline was the most appropriate. 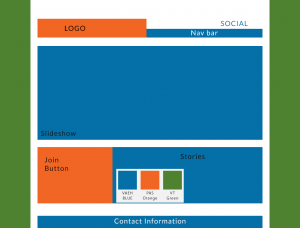 Though Usually I’d spend more time in creative design before implementation. I’m surprised that I was able to crunch it all out. Also I considered many fonts, but settled upon Lato, due to free licensing for print and web.